For me, March ranks up high on the list of favourite months. Although this year may be a rare exception, it is usually the month when the snow starts to melt away as we transition into spring. It is also the perfect time of year to enjoy a week off of work after what is often a busy winter for us teachers. Spending time with the kids, having dinner with old friends and catching up on missed TV shows are some of the ways I pass the time during March break. But it isn't all fun and games. During the week, I make sure to get started on spring cleaning as well as get organized for the much dreaded tax season. While I am not the most organized person on the planet, I can at least say I have a decent filing system for important documents, bills and other papers. I even printed labels for each of my files, too! Granted, I did so when I had more time on my hands, prior to having kids, and thus subsequent file folders may or may not be labeled by hand. But that's besides the point. As long as I know where everything is, I'm happy. I used to have all my files alphabetized but now I simply ensure that my income tax folder is at the very front so it is easily accessible. 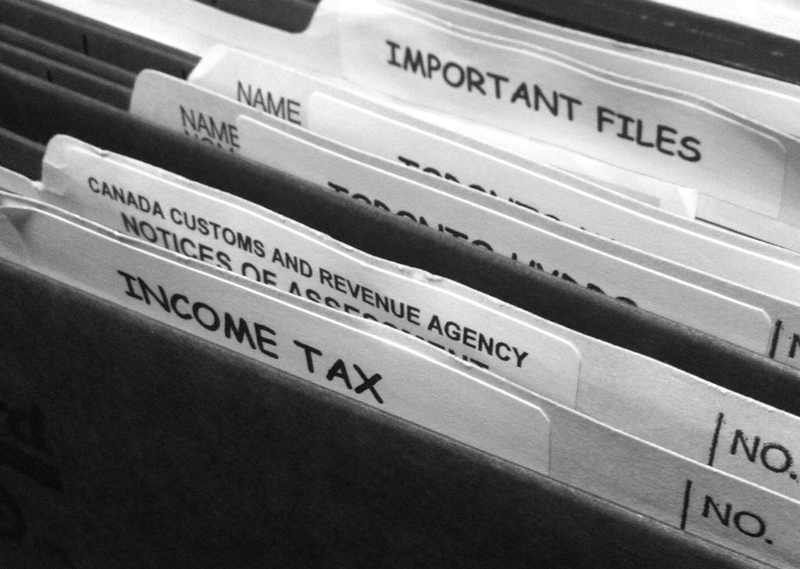 Once I have received T4 slips, receipts for charitable donations and daycare fees, or any other relevant documents, I slip them right into my income tax folder. Then I pass on the folder to my bookkeeper and cross my fingers that I don't have pay even more taxes than I already do. As part of my spring cleaning, I make it a habit to dispose of any unnecessary documents as well as any old credit, debit, or photo ID cards. But I don't cut them into little pieces using a regular pair of scissors like I used to. Not ever since I fell victim to fraud when someone managed to make a purchase using my debit card number. Now I shred them. To bits. And this year, I have a brand new heavy duty shredder from Fellowes to help make the job easier. 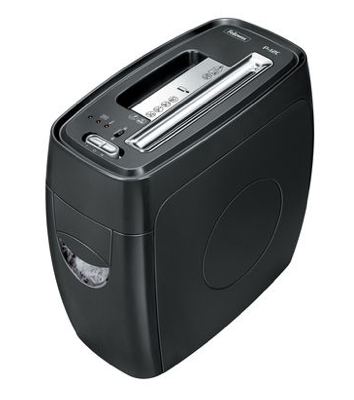 The Fellowes® Powershred® P-12C Shredder, available at Walmart, can shred up to 12 sheets using cross-cuts and can shred credit cards, paper clips and staples as well. It also has a 4-gallon pull-out waste basket and is built with patented SafeSense® Technology that stops shredding when hands touch the paper opening. Here is a list of Top 10 Must-Shred Documents. Since March is Fraud Prevention Month, Fellowes wants to help you properly dispose of your important documents by offering up a Powershred P-12C to one of my readers. Simply fill out the form below to be eligible to win. Also, mark your calendars for the Fellowes Twitter party which will be held on March 26 at 9pm EST. RSVP today! I have a small file holder to keep important papers. I shead papers at my sisters. I use multiple passwords online and store them in a safe place. I have a filing cabinet and I labelled different kind of statements in each of their own separate folder. When I need to dispose of any kind of statements, I always make sure that I cut out my own personal information first (like, name address, account no. etc.) before I recycle the statements, and then I use scissors to cut the personal information part into pieces, then I throw part of it in recyle and part of it in garbage. I Keep all important documents in a locked file cabinet. and then take older sensitive documents to Staples to shred. I use labelled folders to keep everything organized. I have folders and envelope s with import ant papers. I use a portable filing cabinet container with labelled folders in it. I need to pick up another file holder from Wal-Mart...the accordion type with buckle. I have been using cardboard magazine holders and that isn't working for me at all. I shred everything...my shredder broke a few months ago and I haven't replaced it yet...I keep all papers to be shredded in a bag....and take it to be shredded on a month to month basis although I don't suppose that is such a good idea. It is so easy today to give out too much information. I have a file folder that I use to store my important documents. We file everything in a folder in a file box we have in our bedroom closet! We have a file box. We use to keep a whole file cabinet but our new home does not have the space. It works well. We have a safe for important papers. I shred all the unwanted paperwork, etc manually so I could definitely use this! I hand rip all mailings and such, I could so use a shredder. My top tip is always cover your pin when entering it at a merchant or a bank machine! I have on draw in my desk that I put all important papers into , then sort them later into there right groups. I have a two drawer filing cabinet. I have a couple of accordion folders. Has dividers. I use one divider for each month. Its not the best for organization, but its small, compact, and keeps everything together. Prevent fraud by ripping or shredding any unused documents, and keep your important documents lock away. We stay organized by filing all of our important papers into our filing cabinet. I have a big pile in my room, generally I burn them when summer comes and we make a bonfire but it's really not the best way, they're not safe! I have little piles all over the house....I could really use an option for organzing. I have some accordion files that I use for receipts. A junk drawer. A papers basket or 2. A cardboard box. We use a filing cabinet and folders to stay organized. I put our outdated files into storage. I would love to be able to shred them instead. I have a really handy drawer in the kitchen with built in file folders that I use. I also have one of those little cheap portable file boxes. They are not really super organized, but they are in boxes in the den. I organize by year. I keep every year in its own box. and the papers that I do not want I give to my grandson, he has down syndrome and has a compulsion to shred. however this shredding has lead him to a small amount of money, he cashes in large bags of shredded paper to a man who buys each bag shredded from him for his fireplace. Change your passwords often, tell NO one what they are, and store private papers in a locked cabinet! We keep all of our important papers in a file cabinet. We use a filing cabinet for our paperwork! We keep everything current within reach to file immediately. Outdated files go into storage. Great subject as fraudsters seem to get smarter & smarter. If it happens to you report it! Don't be embarrassed it happens to a lot of people. I have simple boxes to keep papers organized, as for fraud prevention - shred old docs. I keep all my files in a folder! I use a big brown envelope lol. Best fraud prevention tip I have is to keep your important documents/i.d that you don't need on a day to day basis, locked in a fireproof safe. Don't store I.D etc in a vehicle or unattended wallet or purse. We have a filing cabinet with file folders but we never throw anything out - we just keep adding! We need to start shredding. I'm not organized at all :( I can't give any tips. I know what I have to do but I just don't do them. Every so often I do my office clean up and find all kinds of things. I rip up the document before throwing them out. Right now I have probably 100 different file folders in my filing cabinet organizing all our business information. My best tip for fraud prevention is to always have an excellent internet protection software on your computer, do not cheap out and get a free download for your internet protection, as I found out the hard way! Free will not protect your information! I had my credit card info stolen 3 times last year! I know better now! I never throw anything away. If I do, I tear it in little pieces, or burn it. A shredder would really come in handy. I keep my files in a small file cabinet in my basement, but I wouldn't say it was organized. I have shoe boxes. Yes, that's right. One for every year. They stack to nicely in the cupboard and I can see the years at a glance. I keep important documents in small cabinet. I keep only what I need and rip up everything I throw away. I have a hold at the credit bureau, that ensures that no credit cards can be issued without a secondary check by me. We are in desperate need of a shredder that does more than 1/2 piece of paper. In the meantime, we cut up all our cards and put them in different weeks garbage runs. My husband works from home so we really need a good shredder! We have a file box with each file that is labeled and we file the information that's important as it comes in. I have a file drawer on wheels. I like it as it lives under my desk and I can haul it out when I need it. Never save your passwords on your computer online & don't give out your pins to anyone!!! I shred anything with my name on it & I don't use a debit card. I keep my files organized in a locked filing cabinet. I bought one years ago. Still using it. I have a filing cabinet which needs to be cleaned out and stuff shredded. We have 2 drawers full of unorganized papers. Files in a desk filing cabinet. Drives me nuts, because I've never had to go back! As the years progress, the old gets bumped out and I burn what I can in the fireplace. I organize by using color coded file folders in the file drawer of our home office desk. I barely keep my files organized...my office is a bit of a mess!! I try to file at least once a week to stay on top of things. Doesn't always happen. :-) My tip for fraud prevention -> don't give out personal information to people you don't know, such as your middle name.